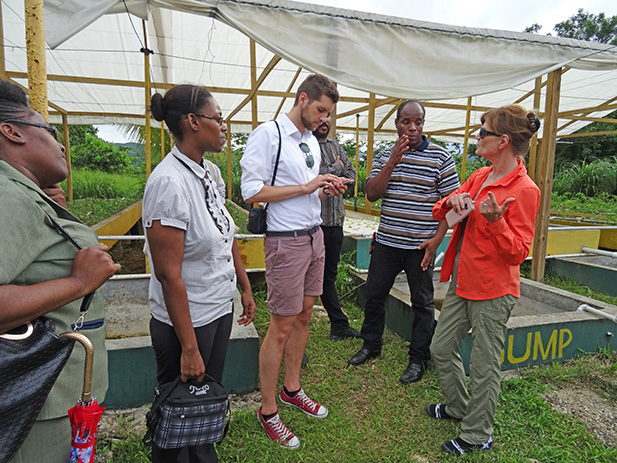 Small-scale farmers in Jamaica got an economic boost on Friday when INMED Caribbean launched a new 4-year initiative to provide access to financing and markets, training and technical assistance to help them start aquaponics enterprises. Called “Increasing Access to Climate-Smart Agriculture,” this INMED program is supported by the Ministry of Industry, Commerce, Agriculture and Fisheries; Ministry of Economic Growth and Job Creation; Caribbean Development Bank; Inter-American Development Bank Multilateral Investment Fund; United Nations Environment Programme/Danish Technical University Partnership and Jamaica’s Rural Agriculture Development Authority. IACA program participant Tanesha Wallace spoke at the launch event of her lifelong love of gardening and how starting an aquaponics business would combine her passion with her need to generate additional income to help support her family after the death of her father. As one of the program’s first participants, Tanesha and other budding entrepreneurs will learn the many advantages of aquaponics for improving food security; adapting to climate change; providing greater access to fresh, nutritious and local food; protecting the environment; and bolstering community development. Follow Tanesha’s progress and learn more about IACA at https://inmedcaribbean.org.